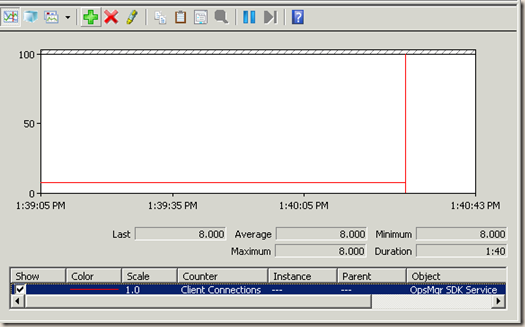 Recently, I’ve been working on a utility based on PowerShell scripts using WinForms GUI to perform some SCOM tasks (i.e. 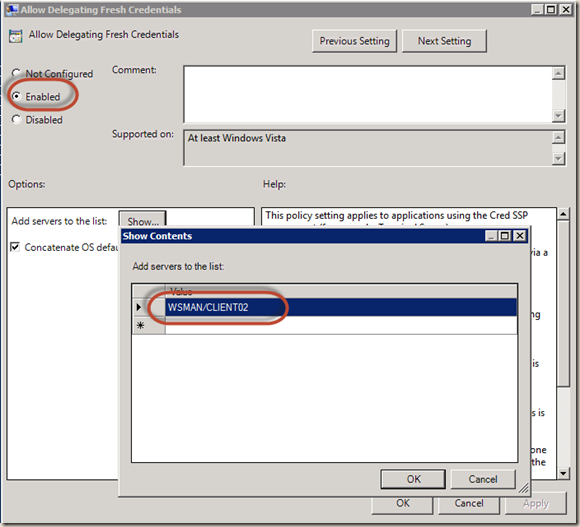 create maintenance window, approve manually installed agents, adding network devices, etc.). Since this script is going to be widely used in the organisation when it’s completed, I’ve always kept in mind that when users run this utility, the utility should only connect to SCOM SDK service when required and disconnect as soon as the task is done. 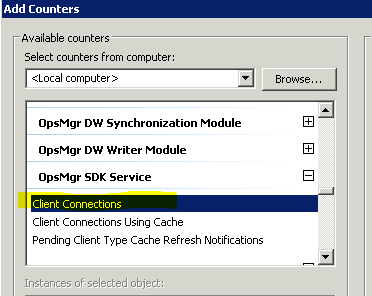 In another word, I don’t want this utility to remain connected to the SDK service because Microsoft recommends the concurrent connections should not exceed 50 per management group. $RMS = "<RMS Server Name>"
I couldn’t unload the SDK DLLs as I read it’s a limitation in .NET, the only way to unload a loaded DLL is to close the app. 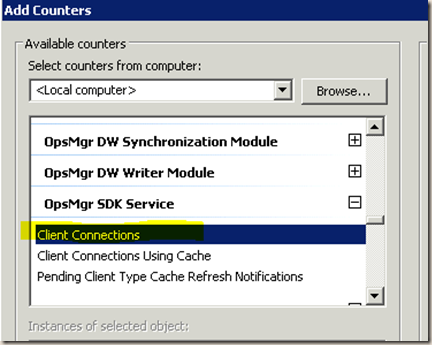 Regardless which way I use to connect to SCOM (PowerShell Snap-in or SDK), the perf counter does not drop when I tried to disconnect using methods above. 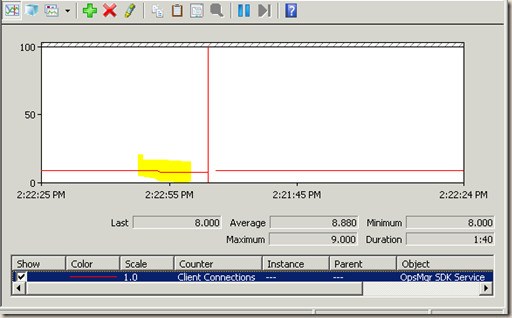 In fact, I could only get the counter drop when I close the Powershell console (or exit my GUI app which is just a pure Powershell script). 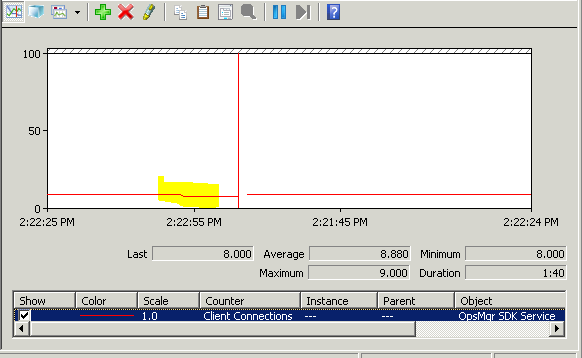 As shown above, notice that as soon as I exit PowerShell, the counter has dropped by 1. Therefore, I thought I had 2 options to work around this issue. 1. Getting the script to launch another powershell.exe instance when trying to connect to SCOM every time but by doing so, I can’t really pass data / variable back to my script. 2. 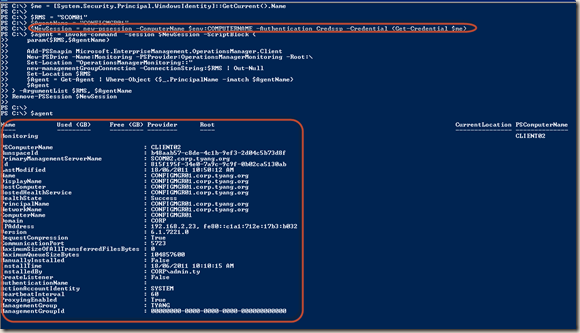 Use PowerShell Remoting to create a PS Session on local computer, run whatever needs to run against SCOM and remove the PS Session when it’s done. By doing so, I can still pass variables back to my script. 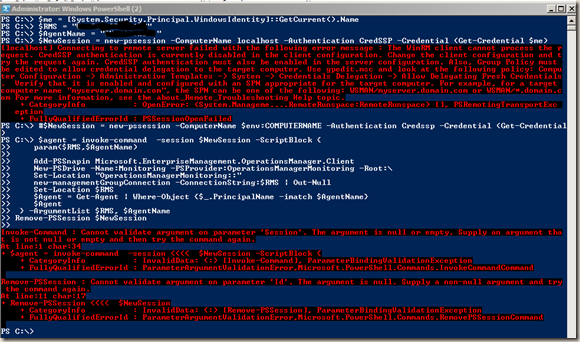 So I’ve decided to go with PowerShell Remoting. I’ve used “Enable-PSremoting –force” cmdlet to enable PS Remoting with all default settings. $AgentName = "<Agent Computer Name>"
The user does not have sufficient permission to perform the operation. 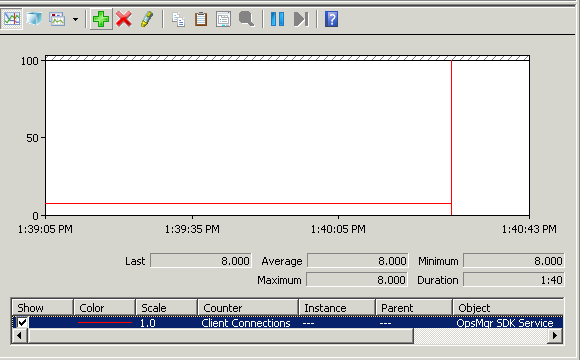 I then found that I will also have to configure the remote session to pass my credential to the remote server again – in this case, the SDK service in SCOM RMS (second hop). 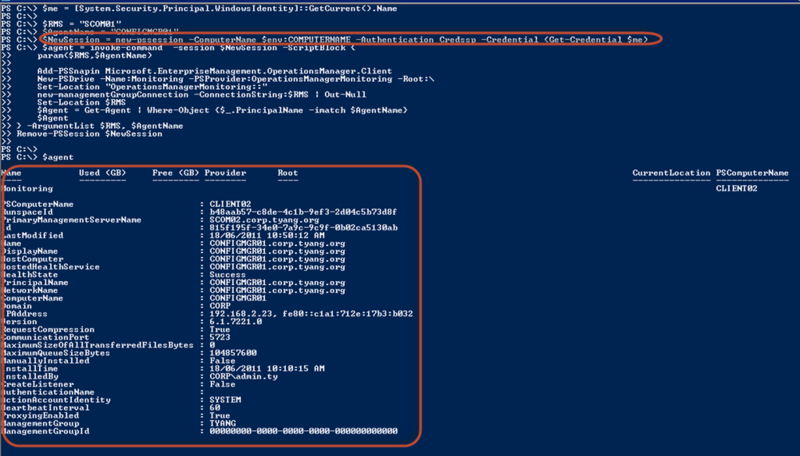 so my credential will be passed from Local PowerShell session –> PS remote session on the local computer –> SCOM RMS SDK Service. Now, after I updated the group policy (gpupdate /force), the code should just work. 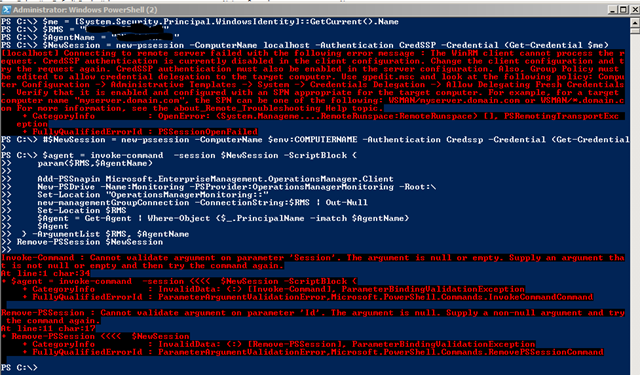 As shown below, I have retrieved the agent information using SCOM Powershell Snap-in via a PS remote session. My script has connected to the SDK service for few seconds then disconnected! I could not use “localhost” as computer name when creating new PS session (and adding “WSMAN/localhost” in “Allow Delegating Fresh Credentials policy”. It doesn’t work. Additionally, I ran into this free ebook about a week ago, Even though I’m still reading it, it’s a pretty good book: Secrets of PowerShell Remoting. Very nice result. Thank you for sharing this.